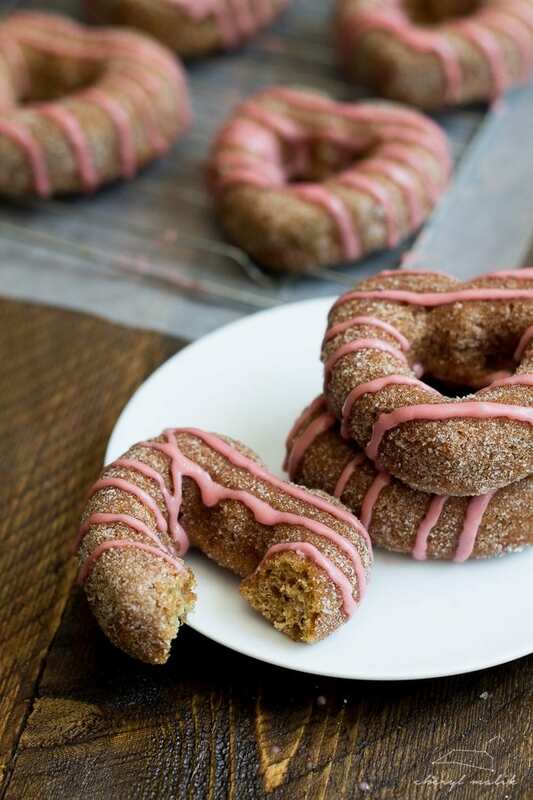 Is it because I made tender, moist apple cider donuts, spiced up to here with warm autumn spices, rolled in cinnamon sugar, and drizzled with a pomegranate glaze? No! Is it because I had a moment when I first tasted these babies, a moment where I dropped my chin and widened my eyes in disbelief that they could so rich, moist, baked and vegan? No! Is it because I sent the rest to work with O (because you know what would happen if I kept them in the kitchen) and they were scarfed down in three minutes flat? Is it because his vegan colleague texted him to tell me they were “f***ing awesome*”?! No! Is it even because I finally got to use my heart-shaped donut pan? No! But seriously, get one of these. The donut cuteness is worth every penny. 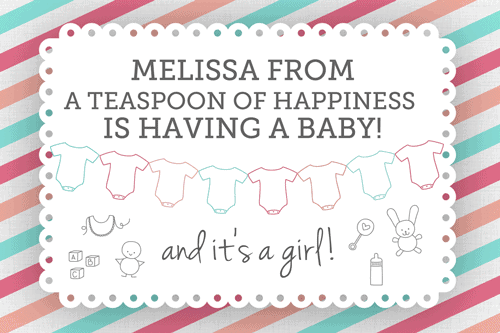 But no, today is special because today we celebrate Melissa Belanger of a Teaspoon of Happiness. She grew a human and it’s almost time to meet her! That’s my super creepy (I’m still totally awed by the actual um, childbearing process) way of saying.. she’s having a baby, and it’s a girl! Now, if you’ve never read Melissa’s blog, a Teaspoon of Happiness, it’s time you start. Melissa comes up with totally family-friendly recipes that are both easy and elegant, a gorgeous mix. Her husband is a professional hockey player, and they move around constantly—they’re currently in Amiens, France, but when I “met” Melissa, they were in Kazakhstan! There was always a couple views on my blog from Kazakhstan each day back then—so Melissa creates these recipes that both feed a hungry man and use universal, wholesome ingredients. She writes about her travel tales in her sister blog, Love in a Suitcase! Melissa and I have been bloggy friends for what seems like forever, starting with sending lengthy emails back and forth discussing blog strategy and tactics, lamenting blogger life (recipe testing failures and the “Oh I have a friend who writes a blog, too!” response when you tell someone you are actually a food blogger. The struggle is real, people), sharing guilty pleasure TV shows, and discussing men in general. This girl is awesome, and you want to know her. Just saying. So since I couldn’t actually, you know, go to France to throw this hot mama a baby shower, I figured I’d gather some blogger friends and do it virtually! 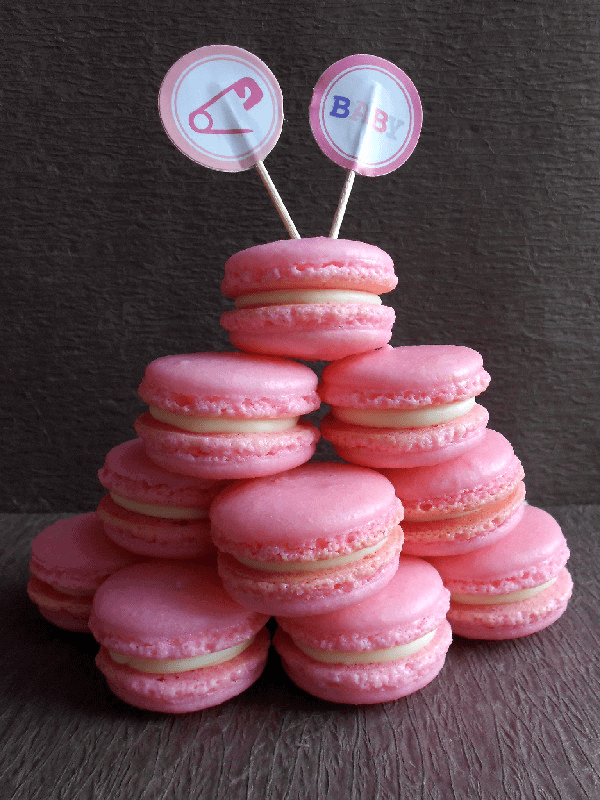 Some incredible bloggers and I have all made the recipes we would have brought to Melissa’s baby shower in real life and posted them to share and celebrate! We’ve got some seriously great stuff for the virtual party, and I hope you love their recipes as much as I have. These donuts are positively perfect for a fall baby shower, and the pomegranate drizzle is perfectly girly without being, you know, a baby carved out of a watermelon. They’ll go fast at any shower you throw, but they’re perfect for fall without any great purpose. The apple cider is reduced, concentrating the flavor, and the cinnamon sugar adds the perfect texture to the moist cake, making these a recipe you’ll make all autumn and drool over on Pinterest during the summer months! 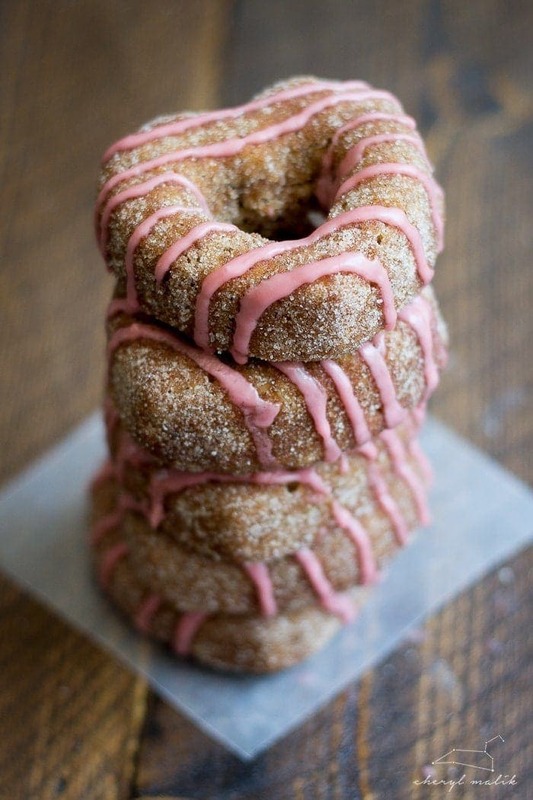 Perfectly spiced and moist apple cider donuts rolled in cinnamon sugar and topped with a tart, pink pomegranate glaze. Absolutely perfect for fall. Vegan! Simmer apple cider over low-medium heat in a small saucepan on the stove for 15-20 minutes. Add cinnamon sticks, if you like, to enhance the apple cider a bit. We're reducing the apple cider so you get a strong apple cider flavor; you need 1/2 cup total cider reduction. Allow the reduction to cool in the refrigerator as you prepare the other ingredients. Pour 1/2 teaspoon lemon juice into a measuring cup then add almond milk to make 1/2 cup. Set aside and allow to curdle to make "buttermilk". Preheat oven to 350º F. Spray a donut pan with nonstick spray. Set aside. Whisk the flour, baking powder, baking soda, cinnamon, cloves, and salt together in a large bowl. In a medium bowl, whisk the flax egg, melted Earth Balance, brown sugar, and granulated sugar together until smooth. 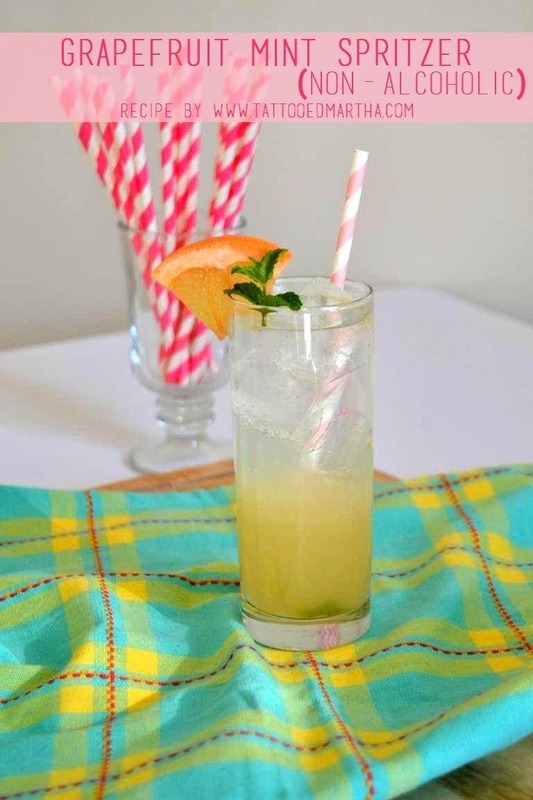 Whisk in the "buttermilk", vanilla extract, and 1/2 cup of reduced apple cider. Pour the wet ingredients into the dry ingredients and very gently mix together with a whisk. 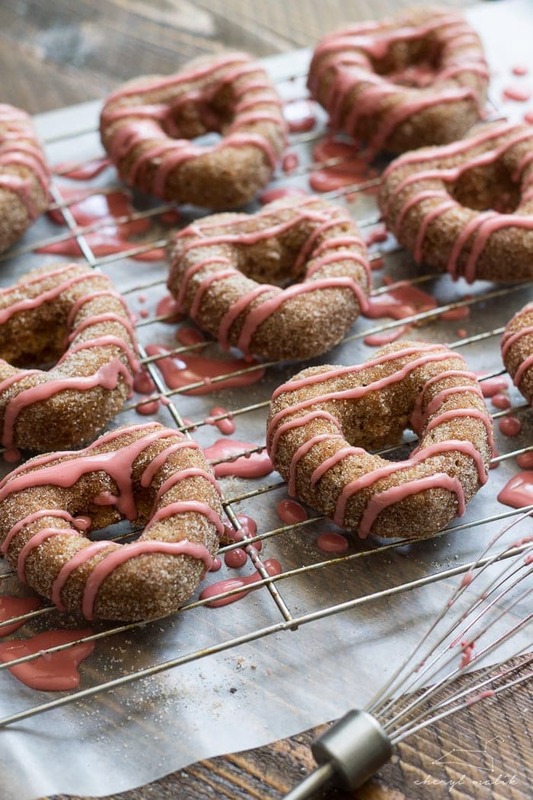 Overmixing will create gluten, which makes a tough donut, so be very careful! Whisk until just combined. A few small lumps are OK, especially since we'll be rolling the donuts in cinnamon sugar. Pour the batter into the donut pan, filling 1/2 of the way full. Bake the donuts about 9-10 minutes or until a toothpick inserted in the center comes out clean. Let cool a few minutes in the pan a few minutes then remove the donuts from the pan and let cool completely on a wire rack. To make the topping, simply whisk together the cinnamon and sugar in a small bowl. 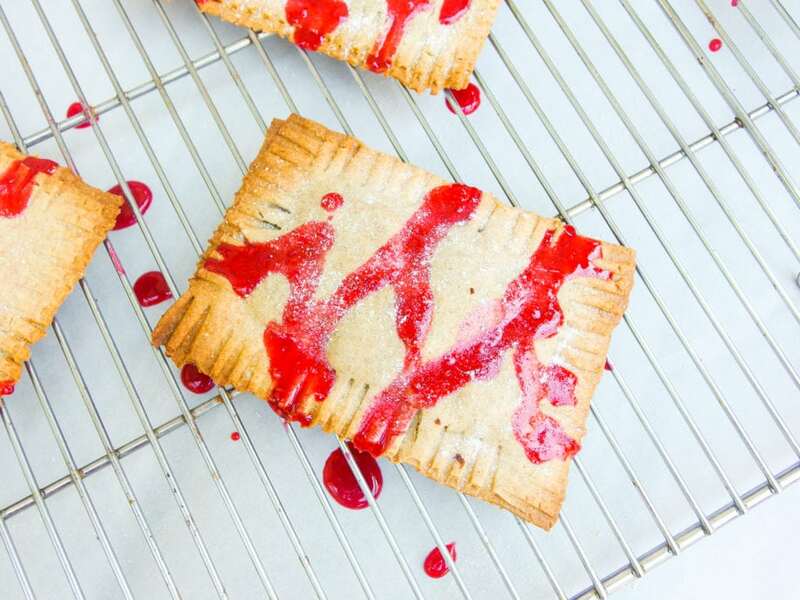 To make the glaze, simply whisk together the powdered sugar and pomegranate juice. 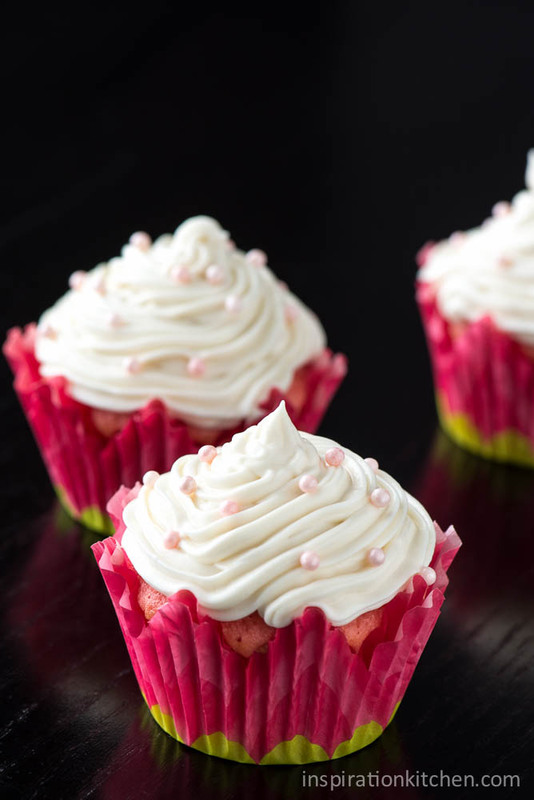 If you want a pinker glaze, add a drop of red food coloring at a time. To assemble: one by one, toss cooled donuts in powdered sugar mixture until completely coated. Place on a wire rack then, using a butter knife, spoon, whisk, or piping bag with very small tip, drizzle glaze over tops of donuts. Let set for about 10 minutes before serving. There are best the day of but keep for a couple days in an airtight container. Without further ado.. Melissa B’s virtual baby shower! Wow, these look incredible and I absolutely love that you managed to match the color of the glaze with that of your logo and hello bar. Yes! That was completely intentional! 🙂 Well, now I’m going to claim it was. Thanks Nicole! Oh dear Lord. These must be what heaven tastes like. I can’t even. They ARE pretty damn good, I must admit. 🙂 Thanks Meredith! Two things I thought when I saw this recipe. First that that heart shaped donut pan is ADORABLE and I need it in my life. 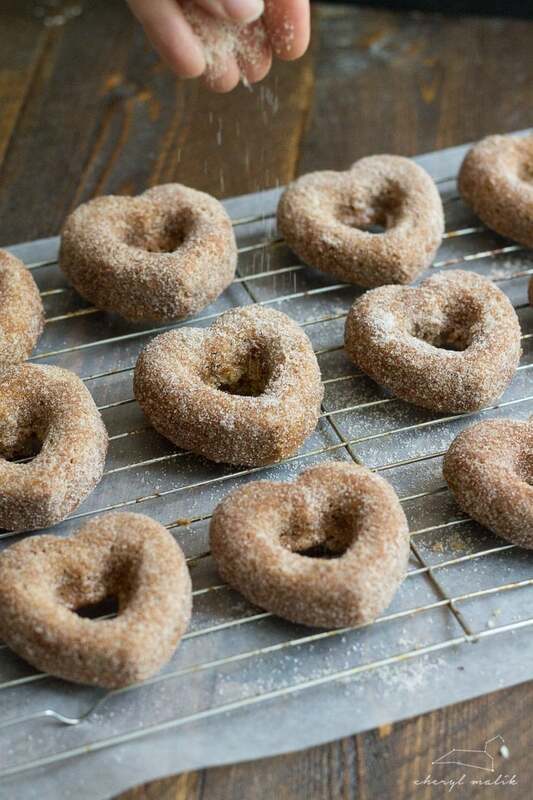 Second, that these apple cider donuts look perfect – I literally want to reach into my screen and grab a bite! What a wonderful way to celebrate your friend’s baby shower! Oh and Pinned!! Uhhh, gimme? Donuts are my favorite, and these heart-shaped ones have stolen mine! What an incredible sweet idea, Cheryl! I’ve never met Melissa, but you’d better believe I’m heading over to her blog now. Also, these donuts look incredibly luscious and perfect for the fall. I’ve never made donuts at home, but it’s clearly time I did! These were my first at home, actually! I’ve always been a bit intimidated–not sure why–but they were so, so simple. And Melissa is awesome! You’ll love her blog, really 🙂 Thanks Erin! Thanks Sasha! And THANK YOU for being such an awesome sport and participating in the baby shower! Pomegranate glaze? ARE YOU TRYING TO KILL ME? 😉 I’m swooning! Death by pomegranate glaze! #1 suspect.. 40 Aprons. 🙂 Thanks Carla! What could I use in place of the donut pan? You could probably use a nonstick mini-muffin pan and use a couple to a few teaspoons per “donut”, which would then sort of become donut holes. But the pans are awesome to have, and really cheap! For anyone else trying these as muffins, I used 2 Tblsp batter and found that 14 minutes at 350 was just about right. And they are sooo good, Cheryl! Great suggestion, Dave! Thanks so much – glad you liked! It was so wonderful that you & many of you “threw” melissa a baby shower. It was such a nice gesture, and I am so happy for melissa. I will definitely check her blogs out. But let’s talk about your insanely good looking donuts for a second. Those are truly fantastic!!! 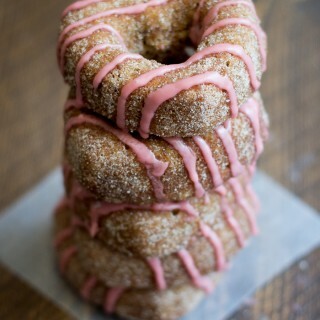 Everything about this donut makes me drooled, I mean who does that, baked apple cider donuts with pomegranate glaze. Baked, yummy with glaze, and it’s vegan!!!! Oooooh, I’ll take two please! No, make that four! These doughnuts are perfection. 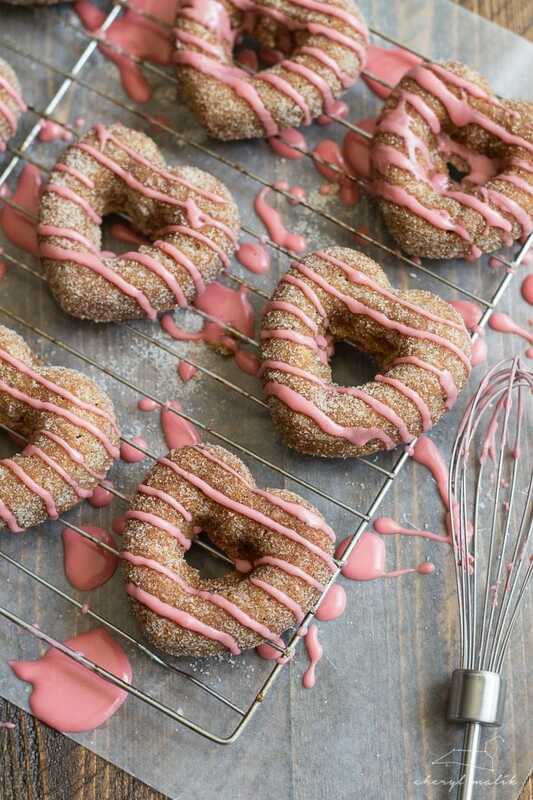 You put my favorite doughnut coating on these babies, and then went further and topped them with pink glaze!! I would have to send them off too, with Rob, to work! And they’re heart shaped… I NEED one of these pans! The doughnuts are so pretty, Cheryl! Thank you for pulling this together! I had so much fun! Can’t wait to check out Melissa’s blogs. These look amazing! I wish I had one to eat right now! I seriously can’t get over how beautiful these are. 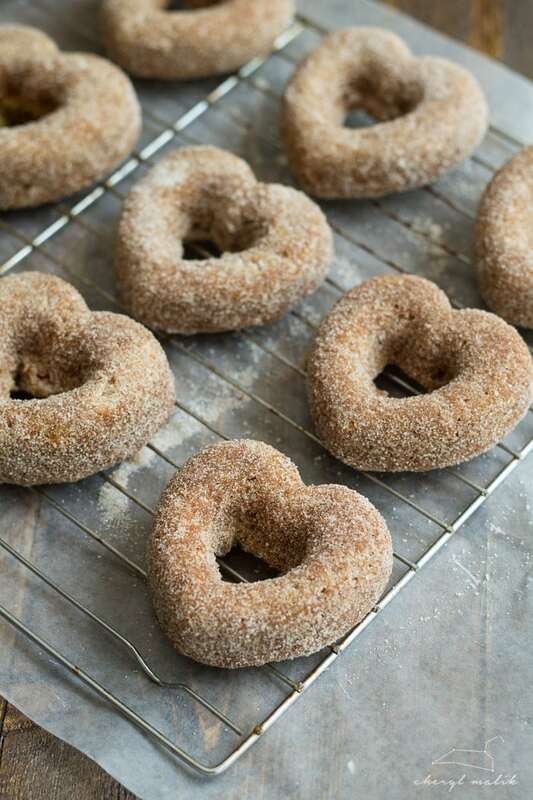 Heart shapes were just made for these donuts! I am in total agreement with you there. No more boring round donuts for me! Thanks so much 🙂 I wish I had one to eat right now too! These look so decadent and delicious! I’ve got to try that pomegranate glaze! Congrats and thanks again for throwing this baby shower it was so much fun! SQUEE! So cute!! Loving that glaze, girl! Oh my goodness. The CUTENESS of these donuts…I can’t stand it. I MUST know where you got your heart-shaped donut pan. NEED. NEED. NEED. 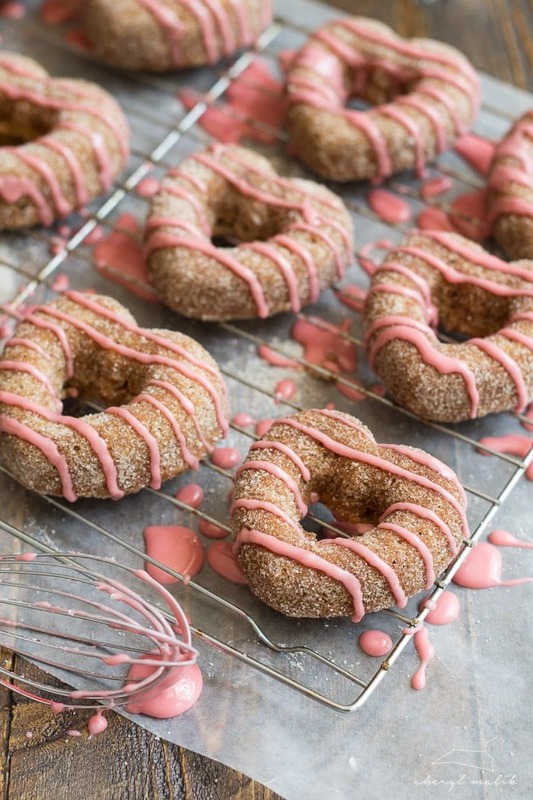 Also apple cider donuts are pretty much my love language these days and I’m dying over how pretty that pomegranate glaze looks—what a fun twist! Right?! That heart-shaped donut pan is like my most prized possession. Although I only have one, so it took me three batches to make these puppies.. ha! By the way.. writing that made me realize I actually published the post without a recipe. Woops! One of those days already, eh? 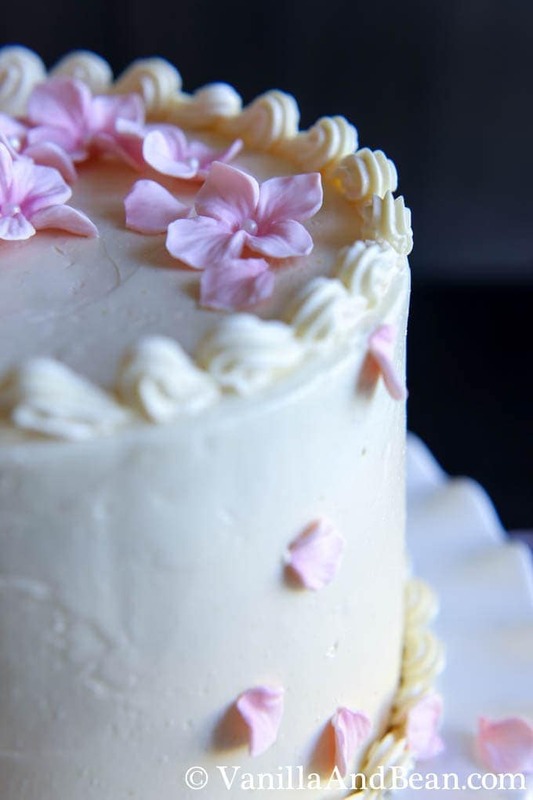 I just saw these beauties over on Traci’s Vanilla & Bean blog! I just thought they looked so scrumptious. I need a heart-shaped donut pan at once! Aw Shannon! You are too sweet. And thank you so much for participating and creating such a crazy awesome recipe! Honestly these donuts surprised me a little, too. I expected them to be good, but when I tried them I think I literally gasped. Ha! 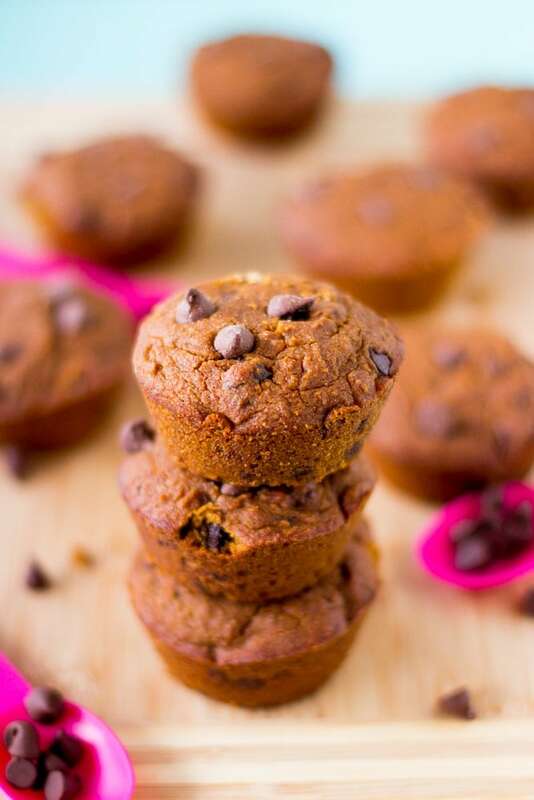 They’re not quite healthy, but totally worth it for a fall vegan treat! I love these donuts – the heart is so sweet, and that cinnamon and sugar coating topped with frosting is making my mouth water. Thank you for inviting me to such a fun event! I feel blessed to have gotten to participate – so fun! We had to celebrate my favorite blogger!! I’m so glad you liked it 🙂 I was so impressed with everyone’s awesome recipes; they did such a great job. I can’t wait for baby B! !